of State of Israel Bonds. 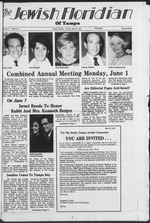 United Jewish Appeal in 1985.
no later than June 4.
a gift from Mr. Newton D.
meeting, wouldn't you want to be there? Well, you are, and it does! will be a presentation by Tampa Mayor Sandra Freedman. dessert will follow the meeting. you will be with us! chief fundraiser, and head cheerleader. vice to Mankind Award" from several Sertoma Clubs. Frances and her family for her great work. she studied photography and graphic design. Brandeis University National Women's Committee. Dr. Program. Rebecca is a resident of the Jewish Towers. Kopelman, son of Sheila and Donald Kopelmaa. the L-rd your G-d in vain. the simple, been absent at Mt. tial part of our being. Eichberg, son of Dr. and Mrs.
Sadofsky, son ofMr. and Mrs.
Dr. and Mrs. Carl Zielonka. Robert David Altus, son of Dr.
Seymour Leibowitz, son of Mr.
of Mr. and Mrs. Herbert Wax. tent as well that is important. great for sandwiches, salads, and hors d'oeuvres. you can take the great taste of Empire along! Empire Kosher makes pleasing easy! The time is April 6, 1944.
nor valuables could be secured. of a resistance after all. despite the fact that the U.S.
U.S. is a Christian Country. violence is on the increase. tanks. The rest is history. they've ever seen this before. and of his own free will. "Barbie did what he did,"
come true, a smashing victory. price we paid for this victory." to work every day in Israel. event on May 7 in Tallahassee. victims of racism and poverty. have raised their SAT scores 150. Calibrating our 10th yaar In Tampa! We also do bar mitzvahs. Reunions. dance, performed by amazing young dancers. job with our Sabra/CIT group. Circumstance, Politics of Israel, and Massage Therapy. Join us for a JCC family picnic! also sponsor a bake sale. p.m. The formal camp program will be from 9 a.m.
Leave Kol Ami 8:15, arrive Kil Ami 5:30.
be received by June 1. WEEK FEE: Members $80, Non-members $120. DAILY FEE: Members $20, Non-members $30. DAILY FEE: MEMBER $20.00, NON-MEMBER $30.00. and talking on the phone! friends she's had for six years. member of the Drama Club. on!" We wish you success!!! she's grown so close to." as well as a patrol. so close and caring at Hillel." be slipping down a cheek. be where it is today. GRADE # TESTED VOCAB READING MATHEMATICS LANGUAGE COMPOSITE NATIONAL %! aired on Channel 12-Cable TV. a national PBS musical special. Israelis are paying a price. there was so much hope." tacts with the Pretoria regime. tions and the Israeli Forum. COACH J. I. M0NT6OMERY. C.C.D. June 6, 1967, both the U.S.
of Dora Hurwitz of Tampa. ed at the University of Tampa. you on Saturday Night Live! spend 10 weeks on a kibbutz in Israel. Send us a postcard! with references. 4 hrs. $30. more critical or in more immediate domand. than it is today. Mr. and Mrs. Hyman P.
Dr. and Mrs. Edward L.
May 26, 27 and 28 at the St.
three years in Nigeria, Africa. volunteer service at the Veteran's Hospital. vice led by Marilyn Wittner. ing to realize this goal. Fares are each way based on roundtrip purchase. continents. And we have the service from Miami to match. offer more 747s to more South American cities than anyone. person in Europe. Some restrictions apply. See below for details. Fores ore each way based on roundtrip purchase.